Street musicians are an interesting lot. To me, they represent enviable confidence, a certain strength of character and a definite passion for music. Performing on street corners, in tucked-away bylanes, outside supermarkets and train stations, or even on crowded public transport, these artists of the street offer their musical talent for everyone to enjoy. And that’s kind of a big deal, right? Think about it – it’s hard work catching the attention of busy passers-by (in all of 12 seconds) and keeping them entertained enough to earn a few coins at the end of it. But to do that day after day is, to my mind, a feat. How many times have you walked past a street musician, secretly enjoying their music but not caring enough to stop and acknowledge? After all, time is too precious to be wasted on nods of appreciation… loose change too prized to be tossed into a coin box or an upturned hat, right? In all honesty, I’m guilty of that too (in case you were going to throw “#preach” in my face). Anyway, I thought I’d share a little anecdote about a street musician whose work I’ve really come to enjoy. 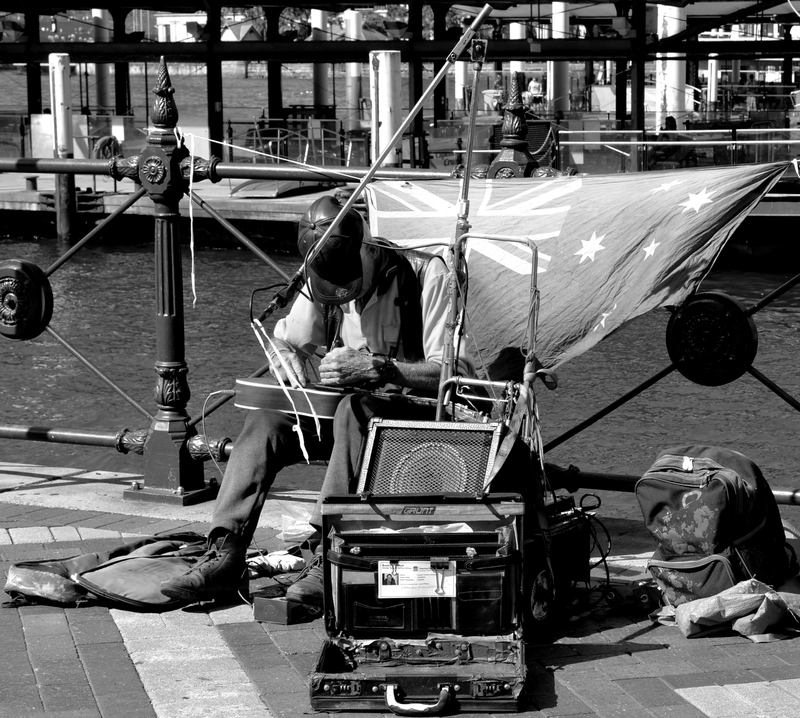 An old guy with a guitar, a selection of harmonicas and a lovely voice, he conducts his business at a tourist hotspot in Sydney (I take that route to the train station). His performances are not spectacularly rousing by any measure… just old-world and comforting in a way that can stir emotion, evoke nostalgia, or just be a pleasant distraction. He mixes up the music nicely and his rendition of Bob Dylan’s Mr Tambourine Man has made me stop and smile (and part with my coffee money) on a few occasions. So, on a Saturday afternoon, I decided walk up and say hello. Little did I know that small talk would earn me a special performance! (watch video at the bottom) Here’s how it went down. I’ve included at the bottom of this post a video of Graham singing. Me: Hi, I just wanted to tell you how much I enjoy your singing. I walk past here everyday and your songs add a great atmosphere to this place. Him: Oh wow, really? Thank you very much. I appreciate it. Do you work at the museum [of contemporary art]? Me: No, I work over at Walsh Bay. What’s your name? Him: Graham. Thank you for stopping by to say hello. What’s your name? And what song did you like? Him: Ah, a Bob Dylan fan then! Look, normally I play Australiana on the weekends but there’s no reason I can’t do a bit of Dylan for you. Not that I’m making any more money haha! Me (surprised): Actually…That’ll be really nice, thanks. Are you sure you don’t mind? Him: Not at all. I love Dylan too. I can’t do a lot of harmonica any more but I’ll do my best. Me: Oh, I’m sure it’ll be great. Do you think I can record your performance? I’d love to share this with my friends. Him: Yes you can. Shall I pose? 🙂 Do you have anything to record with? And so he sang Mr Tambourine Man, and I recorded. A tiny crowd gathered and there was plenty foot-tapping. Purse strings were loosened and coins were dropped. Graham made it a point to acknowledge every contribution. Watch this video and tell me if this is not special! And the next time you walk past a street musician, may be spare them a smile (or if that sounds creepy, a coin would also do nicely). i am smiling here 🙂 and i can’t stop smiling as i read again and listen to it over and over. thanks for this post. Read and smiled…saw and sighed…heard and tapped…scrolled and thought – ”what a lovely post”!